Judas’ Kiss is a hand-painted stop motion short about a judas horse that dutifully leads a band of wild horses into a trap that will ultimately become their demise. In a dream, he is confronted by the horrible consequences of the choices he has made to betray their freedom. 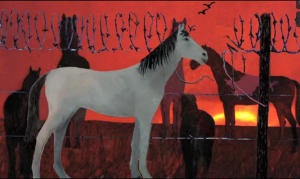 In the end, his epiphany leads him to set the mustangs free, and in the process, he becomes one of them, transforming from domesticated horse to wild mustang. For more information on the plight of the american wild horse, go to the Madeleine Pickens website on my links page.